I LOVE a good falafel sandwich. 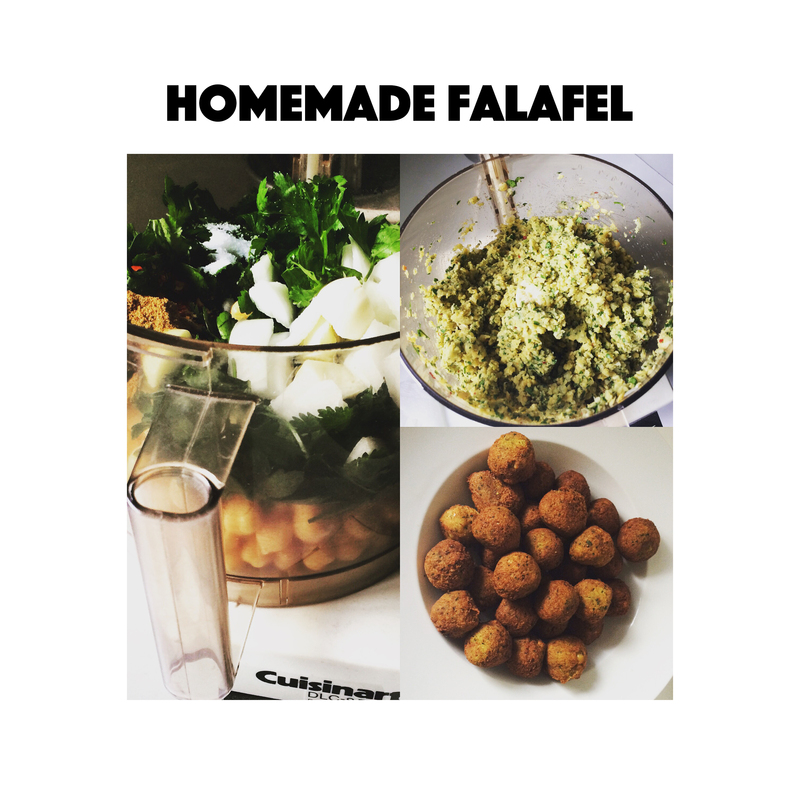 Over the past year I’ve had the pleasure of discovering some of the best falafel around: Falafel’s Drive In in NorCal and Amsterdam Falafelshop in DC. Today, I just couldn’t get falafel off of my brain. Short of buying a last minute ticket to San Jose, CA, I figured the best thing I could do was set out to make my own. To my elation, the results were successful. Here’s a recap of tonight’s falafel adventure. Falafel sandwiches were the goal. I already had a fresh pack of whole wheat pita on hand. My tomato garden is in full swing and with the cucumber in my fridge, I knew I could generate a generous amount of Israeli salad. The falafel was the intimidating part. Fortunately, I came across an approachable recipe on epicurious. Rinse and drain the canned garbanzo beans. If you can, spin them in a salad spinner to remove any excess liquid before adding them into your food processor. 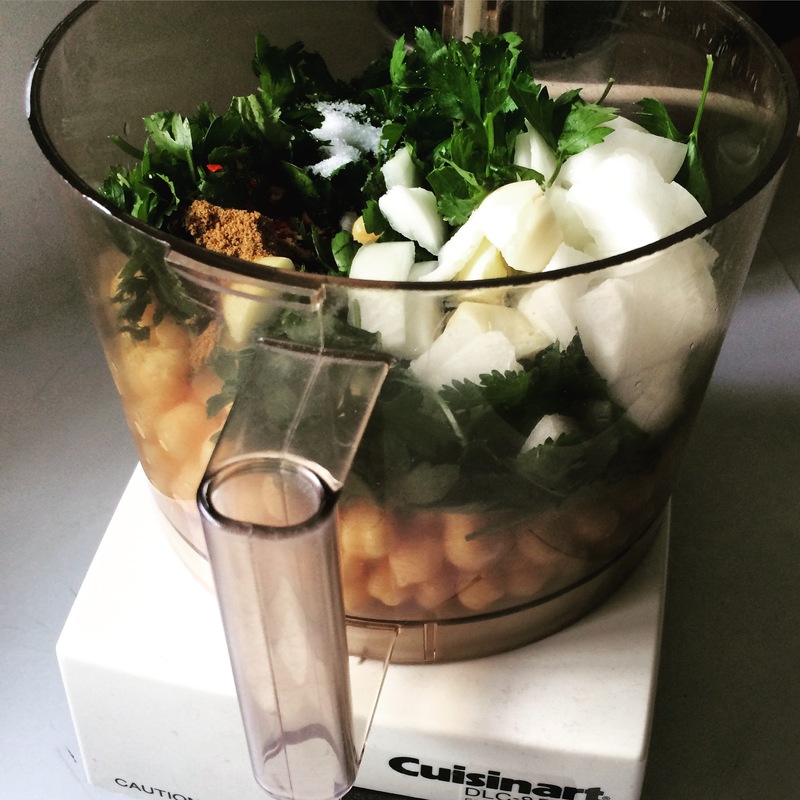 Rinse and spin dry your cilantro and parsley before adding into the food processor with the garbanzos. Roughly chop the 1/2 onion and 4 cloves garlic and add them in as well. Measure out and add your salt, red pepper and cumin and add to the food processor. Pulse the beans, herbs and spices until they form a coarse sandy texture. Now add in the baking powder and flour. You’ll see the dough smooth out as the flour mixes in. 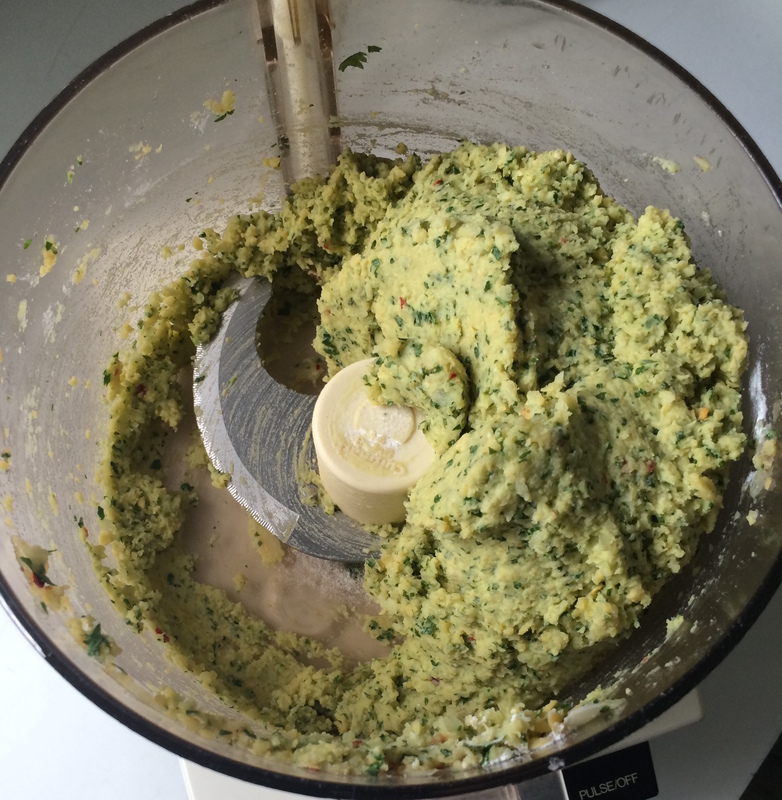 Remove the falafel dough from the food processor, place in a container with a lid and refrigerate, preferably for a few hours. If you’re impatient like me and can’t wait, pop it in the freezer while you continue your prep of the tahini sauce and salad. Remove dough from the fridge and use a cookie scoop (or tablespoon if you don’t have a scoop) to form walnut sized balls of falafel dough. Roll them in your hands gently to form round spheres. 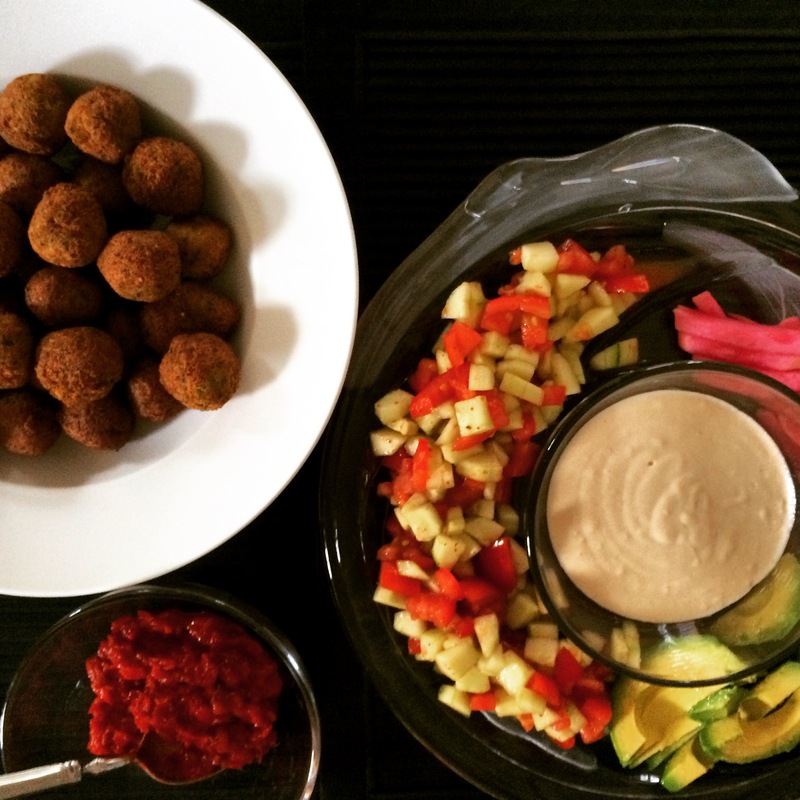 You should get about 20-30 falafel balls. Heat your grapeseed oil in a deep heavy pot (I used my Le Creuset). The recommended frying temperature is 375 F. I didn’t have a thermometer, so I eyeballed my oil and placed a test falafel ball in the oil once I thought it was hot enough. Fortunately, I got lucky on the first try. 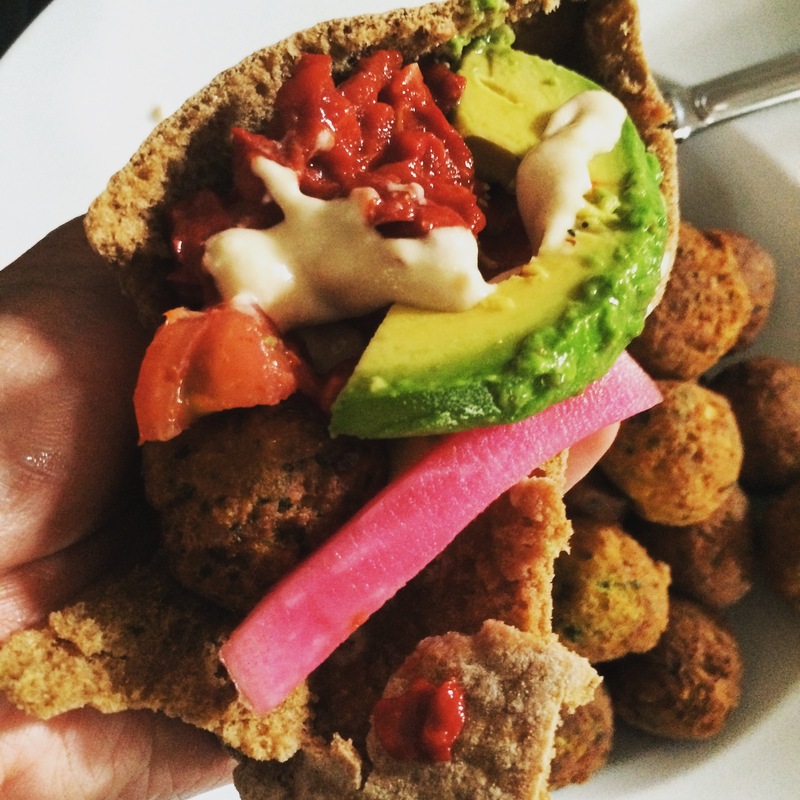 Your test falafel ball will tell you if your dough is the right consistency. It should stay together in a nice sphere as it fries to a rich brown. If it crumbles or falls apart, you likely need another tablespoon of flour. Keep an eye on you falafel. They fry quickly! Once they’re fried all around, remove them from the oil and set them on a paper towel lined plate to dry. Press the garlic into 1/4 cup of tahini sauce. Add in the lemon juice. You’ll see the tahini stiffen and almost become gritty. Don’t worry. Add the water and you’ll see it smooth out into a creamy smooth consistency again. Add a dash of salt to taste and boom! You’re done. I like a loaded falafel sandwich. In addition to the tahini sauce, I add in Israeli salad (cucumber, tomato, red pepper and lemon juice), pickled turnips, hot sauce and a slice of avocado (not exactly traditional, but it works). If you’re eating with a group, consider serving these condiments on a platter and encouraging each guest to assemble their own pita. It’s fun, and you’re sure to get exactly what you want the way you want it. Bon appetit!